Nestled on the beach, this Nungwi hotel is within a 15-minute walk of Mnarani Natural Aquarium and Nungwi Beach. Kendwa Beach is 2.8 mi (4.4 km) away. Nestled on the beach, this Nungwi hotel is within 1 mi (2 km) of Nungwi Natural Aquarium and Nungwi Beach. Kendwa Beach is 1.4 mi (2.2 km) away. Situated in Nungwi, this beach resort is steps from Nungwi Natural Aquarium and Nungwi Beach. Kendwa Beach is 1.9 mi (3.1 km) away. Nestled on the beach, this Nungwi hotel is within a 15-minute walk of Mnarani Natural Aquarium and Nungwi Beach. Kendwa Beach is 2.7 mi (4.3 km) away. Situated by the ocean, this lodge is within a 5-minute walk of Mnarani Natural Aquarium and Nungwi Beach. Kendwa Beach is 2.3 mi (3.7 km) away. Nestled on the beach, this Nungwi hotel is within a 10-minute walk of Mnarani Natural Aquarium and Nungwi Beach. Kendwa Beach is 2.4 mi (3.9 km) away. Well located at the beach. Room was smelling a bit moist (airco was also leaking a bit water). dinner service was excellent. breakfast, lunch buffet were outstanding. Where to find Nungwi hotels near an airport? Where can I find hotels in Nungwi that are near tourist attractions? 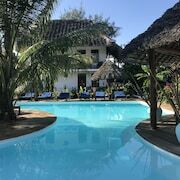 When the time comes to plan your Zanzibar dream vacation, there is an assortment of quality hotel and apartment options in Nungwi. Expedia features 20 accommodation options within a 0.1-kilometre (0.06-mile) distance of Nungwi's heart. Why not find a bed close to Nungwi's heart? 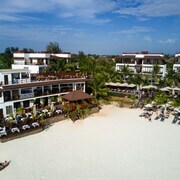 The Essque Zalu Zanzibar and The Zanzibari are conveniently located 1 kilometre (0.6 miles) of the town center. If you have very few wishes and are simply after cheaper Nungwi accommodations, our hotel database has affordable hotels on offer in the area. 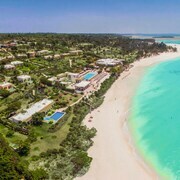 The The Zanzibari is 0.8 kilometres (0.5 miles) from the main part of Nungwi, while the Ras Nungwi Beach Hotel is 0.3 kilometres (0.2 miles) away. The The Z Hotel and the DoubleTree Resort by Hilton Zanzibar - Nungwi are amongst the other economical places worth investigating. The Diamonds Star of the East Zanzibar - All Inclusive is positioned 2 kilometres (1 mile) from the middle of Nungwi. Another option is the Matemwe Retreat - All Inclusive, which is located 13 kilometres (8 miles) away. 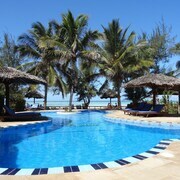 Alternatively, book the Diamonds La Gemma dell'Est - All Inclusive or the Hideaway of Nungwi Resort & Spa. Stone Town is 50 kilometres (31 miles) to the south of Nungwi and is home to the Darajani Market and Beit el-Sahel. 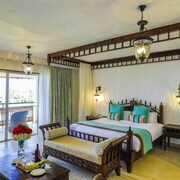 Should you wish to stay in Stone Town, check out the room rates at the Zanzibar Serena Hotel and Mashariki Palace Hotel. 50 kilometres (31 miles) to the south of Nungwi, you may also choose to stay at Zanzibar Town, home to the Zanzibar Palace Hotel and Jafferji House and Spa. If you're staying in Zanzibar Town, set aside a little time to visit the Slave Market and Old Fort. Zanzibar International Airport can be found 55 kilometres (34 miles) away from Nungwi. 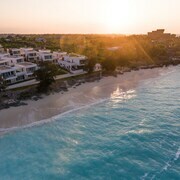 Travelers who choose to stay close by, can easily book a night at the Protea Hotel by Marriott Zanzibar Mbweni Ruins or the Zanzibar Beach Resort. What are the most popular Nungwi hotels? Are there hotels in other cities near Nungwi? What other types of accommodations are available in Nungwi? Explore Nungwi with Expedia.ca’s Travel Guides to find the best flights, cars, holiday packages and more!